Millet is not something you would normally find in the British supermarket but it’s very common in Slovenia. People in Slovenia eat it in savoury and sweet dishes but I only cooked with millet once before – I made millet tabbouleh which didn’t turn out that great. That’s because I didn’t really know how to cook millet properly. Now I know, lesson learnt. 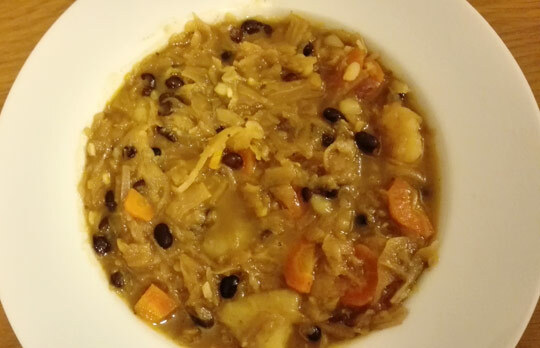 This millet soup recipe is a combination of recipes from various Slovenian websites. I decided to use the following mix of vegetables: mainly cauliflower, some broccoli and one carrot. You don’t really need to use broccoli, I only used it as I had some left. 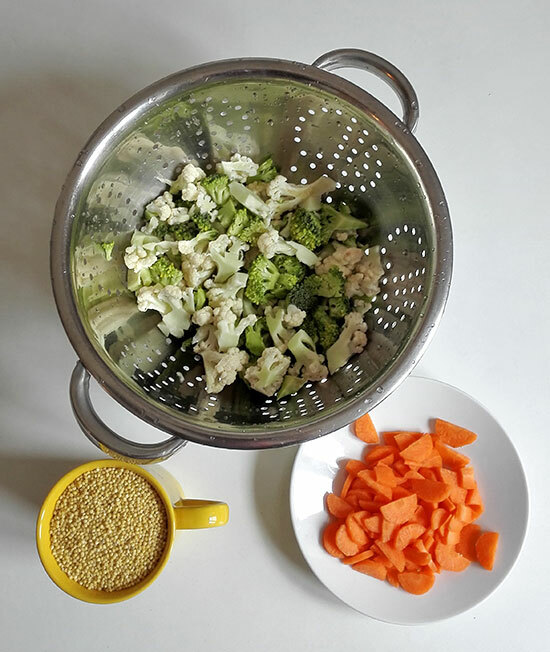 I would recommend you use mainly cauliflower for this soup as it goes really well with millet and sour cream which you add towards the end. You could of course experiment with other types of vegetables such as peas, courgettes, kale and celery. Just something to keep in mind. You don’t need to use cauliflower. A little bit about millet.. Millet is a type of grain which is rich in minerals such as calcium, phosphorus, magnesium and iron. It also contains various E and B vitamins. What’s more, it’s rich in insoluble fibre which is great for your digestion. It’s also gluten-free, so great for those suffering from celiac diseases who are often irritated by the gluten content of wheat and other more common cereal grains. Before you cook millet you have to wash it really well. I made this mistake when I cooked it for the first time, I didn’t wash it at all! This resulted in a slightly bitter aftertaste when eating it. It was weird but I still ate it. This could however also be a result of rancid grain. When you buy millet you don’t know how it was stored and for how long. It happens very easily that you could buy a rancid millet so it’s always good to buy from a reputable source. In Slovenia I bought millet a couple of times so far and I never had any issues with it. The best is to soak millet overnight and wash it well. Like this, you should be able to get rid of any bitter aftertaste (in case it’s rancid). 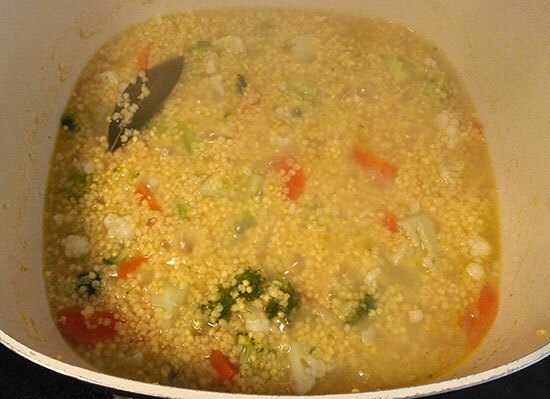 Millet is ready in around 15 minutes or less if you soaked it overnight. You will need to use 4 cups of water for 1 cup of millet. Just to mention, millet absorbs water really quickly and it expands a lot when cooking, so normally you need much less than you think. For this recipe I used 1 cup of millet but it was way too much. It took us a couple of days to finish it all (two people). Use half of a cup to start with or even less. 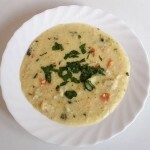 Creamy gluten-free soup great for lunch or dinner, very filling and nutritious. Heat up some rapeseed oil in a large saucepan on a medium heat and fry sliced onion until soft. Add chopped garlic, quickly stir and leave to cook for a few more seconds. Add washed millet, 1 litre of water and then chopped vegetables. Add bay leaves, stock cube and a pinch of nutmeg. As millet cooks you will notice it will absorb lots of water. Add more water as needed. 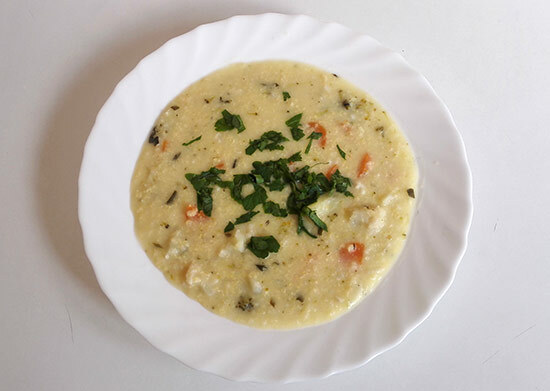 Once millet and vegetables are cooked (after around 15-20 minutes), take the saucepan off the heat and add egg yolk and sour cream mix into the pan while stirring. Put back on the heat and cook for a few more minutes. Serve with chopped parsley on top and a side salad. To make this meal vegan, just skip sour cream and egg mixture. Instead, use a small cup of water and add 4-5 forks of gluten-free flour. Mix well until smooth. Add to the soup while it's cooking (at the end).